This is the photo reference which I will be using for my painting. I'm currently working on a new still life painting entitled "Hidden Memories". This work is in honor of my Uncle Bob (Robert Nippes) who went to Europe to fight in World War II at the age of 17. In this day and age of political strife, angst about the war against terrorism and focus being taken away from the family unit, I want to do a series of paintings about patriotism and what it means to be an American. My husband and I both served our country and are extremely proud of this nation and all it stands for. We might not agree with every single thing the government says, but we agree that we are US citizens and need to support our country to the best of our abilities. That sentiment very sadly seems to be lacking in a number of people today, and even in some of those who want to help run our country. I feel that there is probably very little I can say to change people's way of thinking, but I'm hoping that perhaps I can get folks look at my paintings and feel pride for their country and remember what millions of people in the past went through to give us the freedoms that we now take for granted. If I can get even a couple of people to consider changing their mind about exactly what our country means to them, than I have accomplished my mission. My uncle Bob served with the 3939th Gas Supply Company in World War II. This unit was attached to the 1st Special Engineer Brigade and took part in Exercise Tiger, D-Day and the Red Ball Express, to name a few. As a teenager interested in attending the United States Military Academy, Bob told me tons of great stories of his time spent in Europe with the Army. He was part of my inspiration for wanting to attend the military academy. It was a very proud day for both of us when I packed up and left to pursue my dream at West Point. It was an extremely depressing day for the both of us when I came home two years later, after being dismissed from the academy for medical reasons. Apparently they don't think that you have much use as an officer if you can't walk, even if that is their own fault, but I guess that is a story for another day. 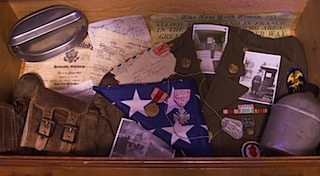 Hidden Memories is a still life painting which includes items from my uncle's time in the war. It includes a WWII uniform dress jacket, with the insignia of my uncle's service. It also has WWII boots, mess kit, canteen and dog tags - all items of daily use in the war. Also included are a newspaper article about d-day, photos of my uncle during the war, and military paperwork. The items are arranged as if these items were placed away in a drawer or trunk, and were just found after many years away in storage. With all of the stories that I have heard throughout my life regarding Uncle Bob's service, I've never once heard about the actual fighting that he encountered. Those memories seem to be tucked away in some special corner of my veteran's minds, not wanting to be recalled. Thus my title of Hidden Memories. It is those very awful moments for the veterans that are the most likely to be the very moments in time which changed the course of history. I am so very proud that my uncle served his country in a time of dire need and I honor everything that he has done in his lifetime for both his country and our family. He is one of the best men that I know. He just turned 84 this month, and I dedicate this painting to you, my wonderful Uncle Bob.